Built by Douglas as a DC-3-194B with Wright R-1820 radial engines. Constructors Number 1941. 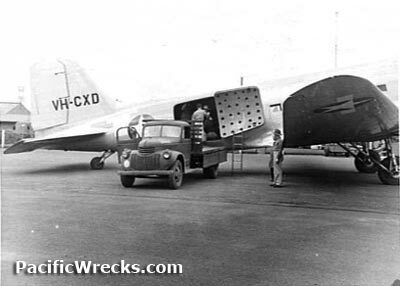 Purchased by the Royal Netherlands Indian Airways / Koninklijke Nederlandsch-Indische Luchtvaart Maatschappij (KNILM) and registered as PH-ALT on June 2, 1940. This aircraft operated in the Netherlands East Indies (NEI). On May 1, 1942 this aircraft escaped the Netherlands East Indies (NEI) to Australia. On May 19, 1942 transferred to the Australian government. Assigned to the U. S. Army Air Force (USAAF) with serial number 41-1941 applied locally. 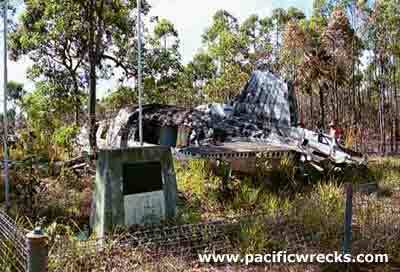 On August 17, 1942 severely damaged during a Japanese air raid against 7 Mile Drome while parked at 7-Mile Drome near Port Moresby. Afterwards, repaired and returned to duty two months later. On December 6, 1942 acquired by Australian National Airways (ANA) with Australian call sign VH-CXD and leased to the U. S. Army. On January 14, 1944 assigned the designation C-49H serial number 44-83228 for administrative purposes for civilian airliners used by the U. S. Army as transports. On March 17, 1945 operated by the Royal Australian Air Force (RAAF). Assigned to 33 Squadron. On May 4, 1945 took off from Archerfield Airfield near Brisbane at 8:39pm on a regularly scheduled courier flight bound for New Guinea. The aircraft was piloted by Clarke, an ANA civilian pilot with a Royal Australian Air Force (RAAF) aircrew. Aboard was a trainee co-pilot, Browne and two American passengers. This aircraft first landed at Garbutt Field and overnighted. On May 5, 1945 took off from Garbutt Field on a flight bound for Finschafen Airfield then onto Nadzab Airfield. In the predawn darkness while circling to land at Higgins Field (Bamaga), crashed into a hilltop at 5:18am and burned on impact, killing everyone aboard. Initially, the military authorities thought that there may have been a third American passenger who boarded the aircraft at Townsville, but this was later found to be incorrect. The wreckage including the largely intact tail section remains in situ. 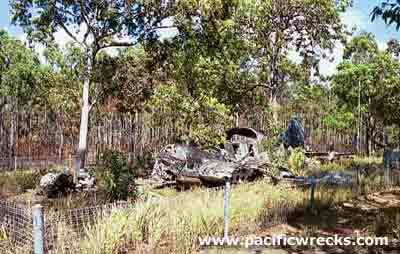 Today, the wreckage is fenced off with a , the wreckage is fenced off with a memorial marker nearby. The entire crew was officially declared dead the day of the mission. After the recovery of remains, the Australians were buried at Townsville War Cemetery. Gidley at E.C.9. Browne at E.D.7. Hornbrook at E.C.5. Taylor's grave is unknown. Clarke was buried at Mount Thompson Crematorium at wall 4, section 3, S/Niche 290. On May 9, 1945 the two American passengers were buried at Ipswich Cemetery with funeral services by Chaplain North. Postwar, their remains were exhumed and transported to the United States for permanent burial. Doherty was buried at Long Island National Cemetery at Plot J, 16404. Kozen's burial is unknown but presumed to be in a private cemetery in the United States. At the crash site, a memorial plaque was erected near the wreckage tail to honor the crew.